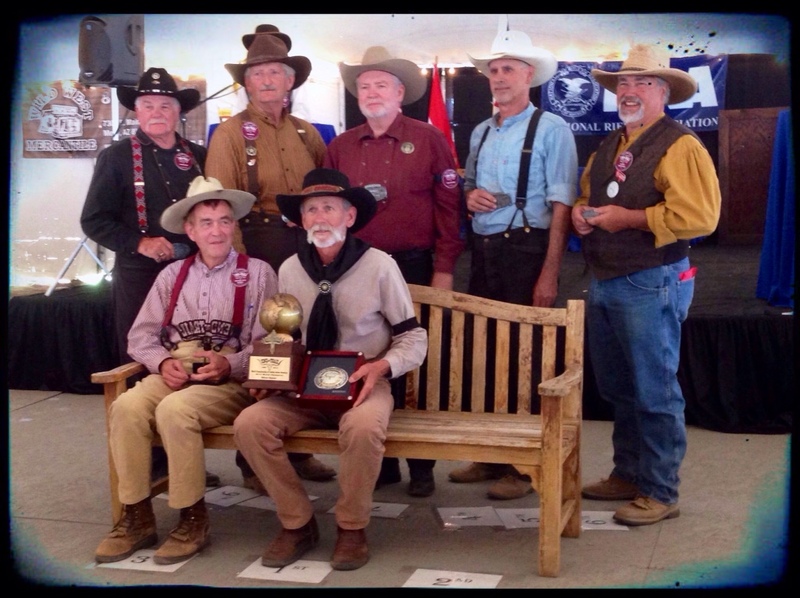 The Plum Creek Shooting Society hosted the Battle of Plum Creek – Bullets and Rails 2018 this weekend at the Comanche Country Ranch owned by landowners Lyman and Nancy who have kept it running as an outstanding cowboy range facility. 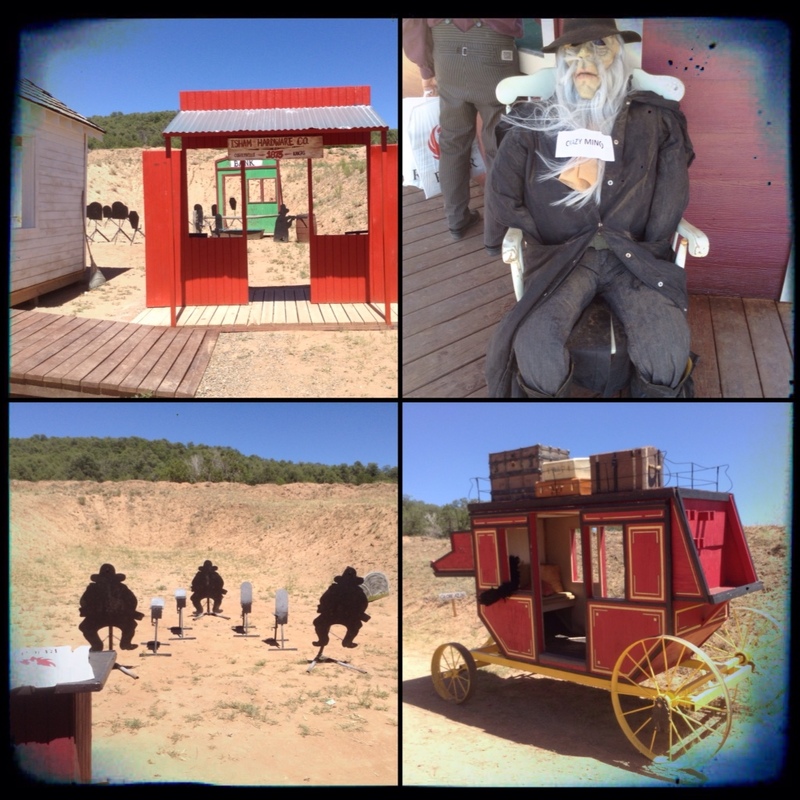 This year the shoot is based on famous train scenes in western movies with even a silent movie start in the Livery. After much rain in previous weeks, it appears the range has been mostly spared and the ground is soft under foot but not boggy. Day 1 was Wild Bunch and side matches which went off in fine sunny weather. Day 2 rolls around with a clear cool start and more sunshine expected to continue. The mornings proceedings start with welcomes, pledge of allegiance, pledge to Texas, prayers and 'Patience'. 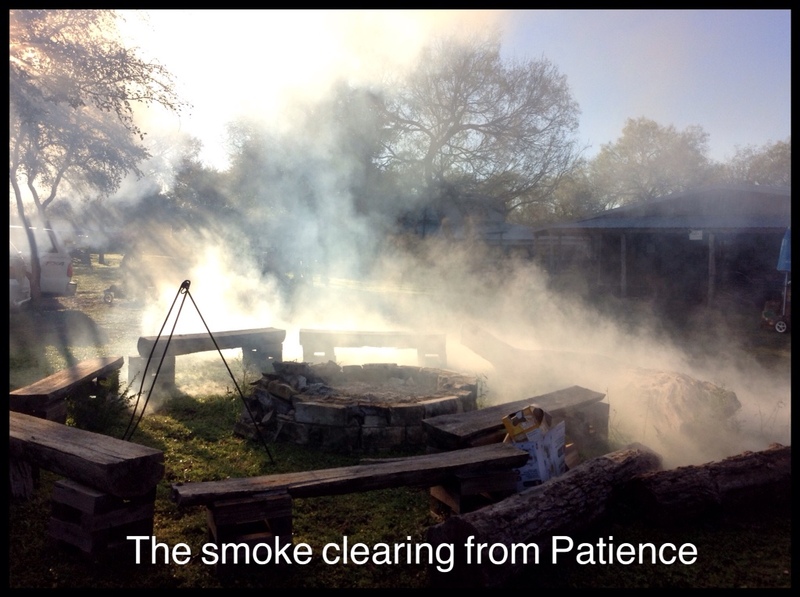 Patience is a cannon but I couldn't tell you the details of her magnificence but if you asked her caretaker, Artiman, I bet you he could tell you more than a story or two. 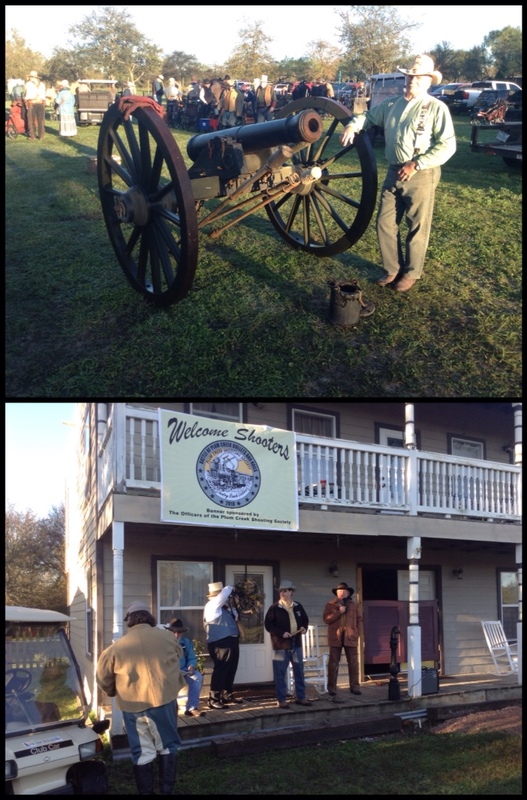 Under the intricate instruction of Artimans artillery commands he and his fellow cowboys, come recruits get Patience ready for action. (You have to go to the Facebook page to see her in action). Now ready for firing, me holding iPad to video, I realise I don't have earplugs and only the capability to plug one ear hole, well….you can see by the video, that I still was not expecting the result! My ears were ringing for a good while! We all moved off to our respective start stages for Day 1 of the Main Match and commenced stages 2-7 with our posse of Texas Ghost, Lady Ghost, Oklahoma Dee, Kansas City Sneed, Lefty Wheeler, Krazy Legs Kay, Texas Drifter, Chisos, Red River Raider (and the ever spectacularly dressed Petticoat Parker), G W Ketchum (thanks Suzie for keeping score all weekend), Six Goin South, Kickshot, Jack and myself. Last night was the banquet and I assisted Six Goin South and Lorilei Longshot with a costume contest in the Parlour House Reception whilst men gathered in the Saloon next door. Congratulations to all who attended and placed. Side match awards were given. A neat train whistle, theme appropriate for the shoot. I walked away with 4 so I may share with Jack if he wants to play trains! Haa haa haa! Thanks Lyman for putting together your band and playing too. Music was great!! Day 2 of the Main Match and we are set to finish stages 8, 9, 10 and 1. We had thunderstorms last night and the range has seen a massive downpour that has created better environments for pigs! Lol! It is boggy as but the match officials are hurriedly running around clearing water and laying bags of sawdust as best they can, After a delay, we started at 9.15am to finish the match. Lunch was on – fajitas – and might I just say the lunches and dinner the crew put on the whole weekend was outstanding especially lunch today. Awesome job and it was very much appreciated. 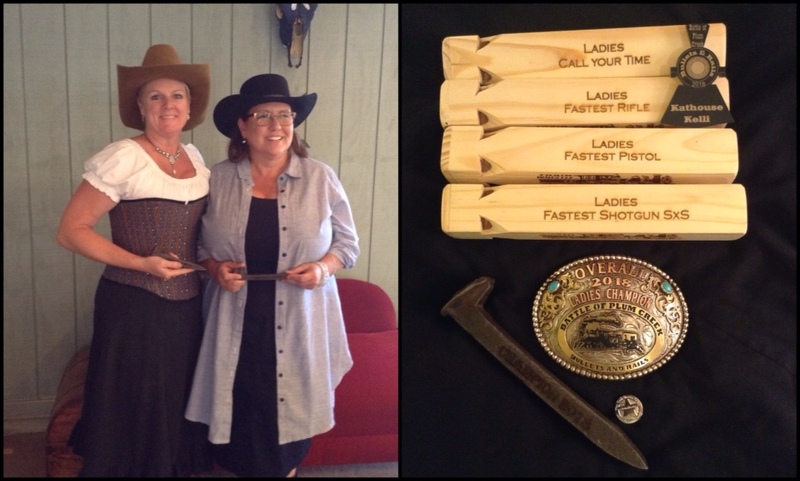 Awards got under way and the prizes were railroad spikes. Not just any old railway spikes I might add, these are the real deal. 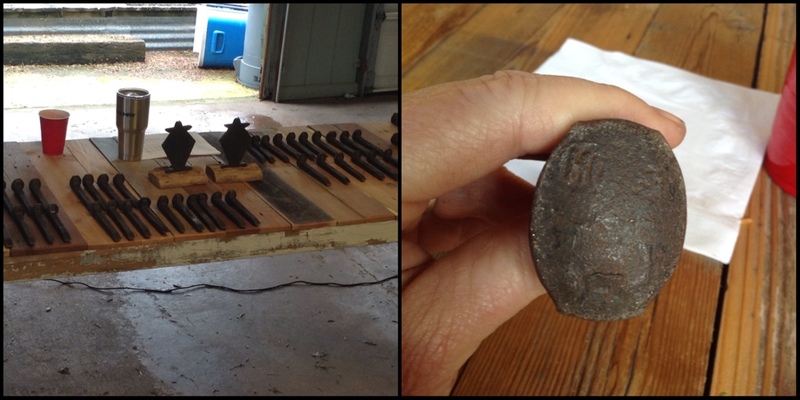 Actual 1800's railway spikes from Texas railroads. Joe Darter gave a little trivia behind them before they started the awards. He 'acquired' these from somebody he knew that had connections. All the spikes are uniquely marked and highly collectible. 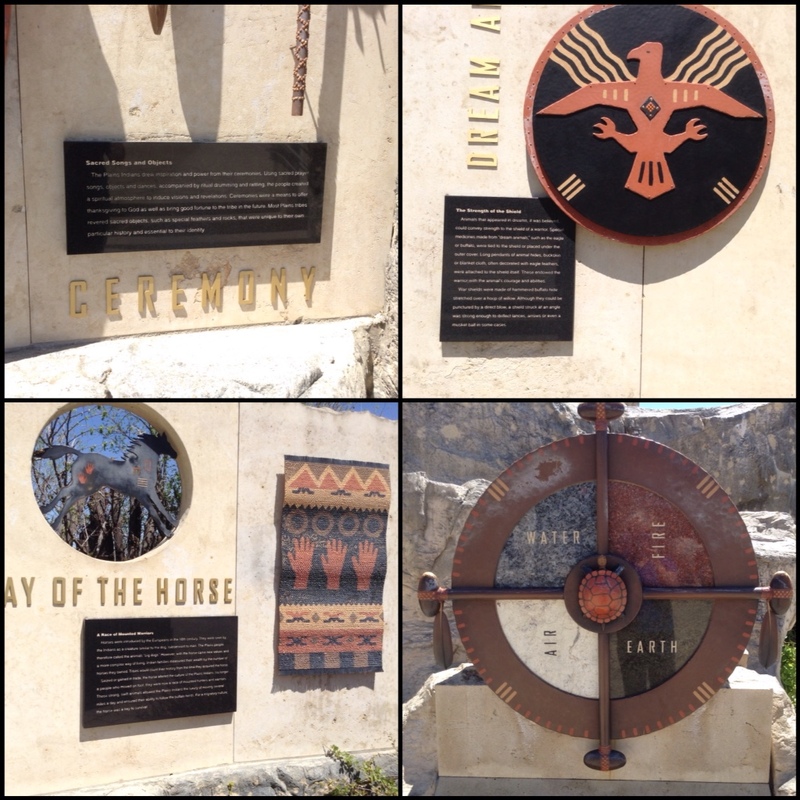 The makers of the spikes would mark their initials or other carvings into them. If you were injured during other railway work back then, you usually ended up with one of these jobs also. All these spikes are marked, engraved with the shoot name and some with Champion on them. 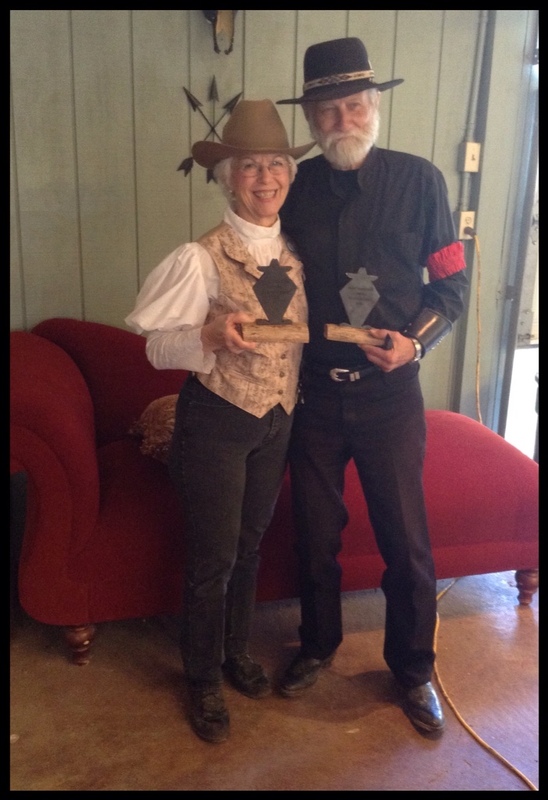 Special awards made by Two Spurs and in keeping with the railway theme were given to our, shall we say, more mature cowboy and cowgirl at the match. 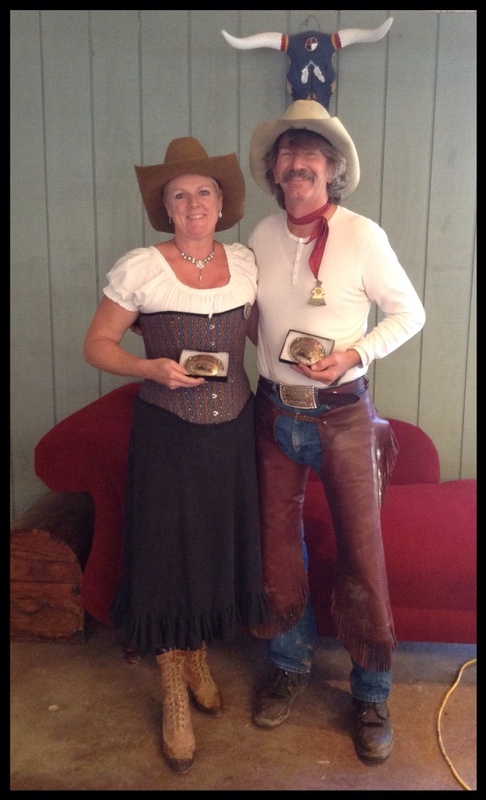 Cherokee Clay and Lady Ghost received these awards for 'Most Train Rides'. Such a neat idea. Jack with a jam in his rifle today finished 3rd in Elder Statesman. Congratulations 1st Skyhawk Hans, 2nd Wildcat Bob, 4th Dusty Mines, 5th Lefty Wheeler, 6th Little Bowley, 7th Ranger Tay. 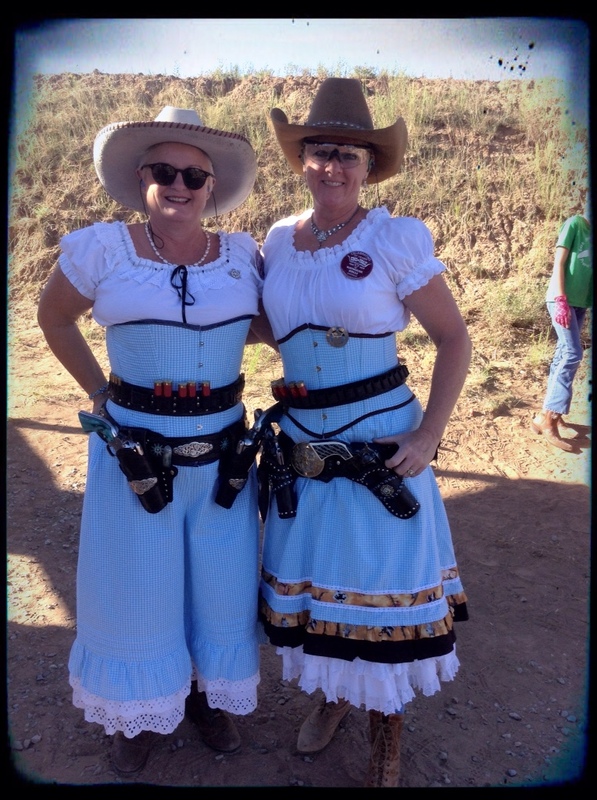 Congratulations to my fellow Lady Wrangler shooter in 2nd place, Krazy Kat. There were 16 clean match winners from 203 shooters for the match. I had a clean match! 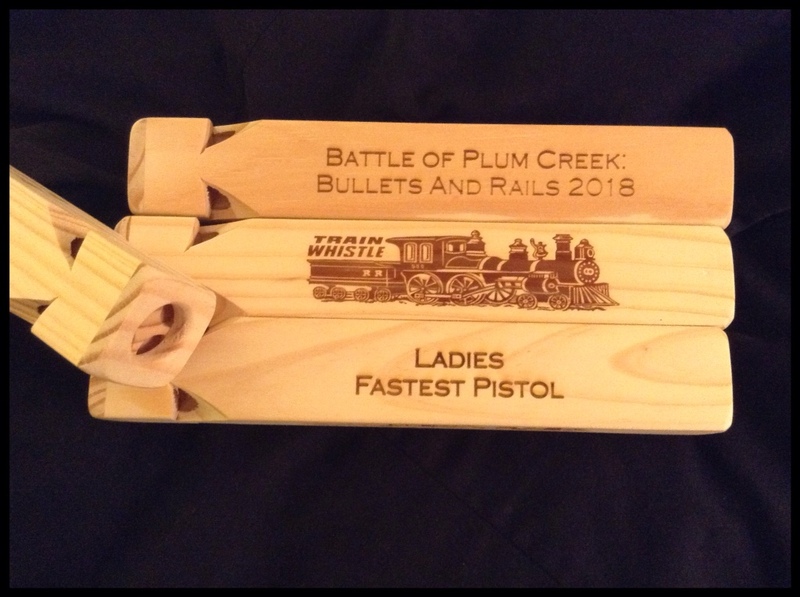 Congratulations to Oklahoma Dee 1st man overall and I won ladies overall AND finished 2nd place in the match right behind him! 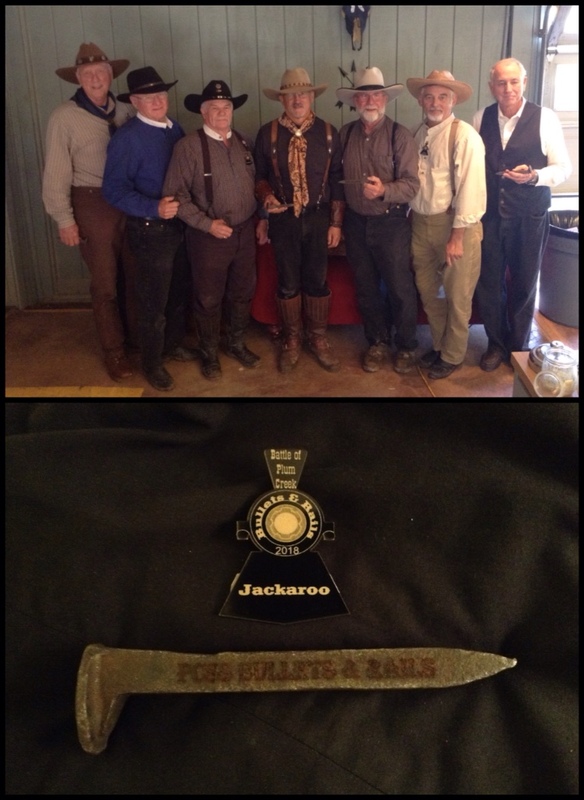 Thanks to all the crew at Plum Creek Shooting Society once again for a great match. Made from Ageless Patterns 1893 Swimming Costume pattern these cute swimsuits are sure to keep a certain cowgirl cool for Summer shoots. When Dirty Nerdy gets these it will suit her personality down to the ground. 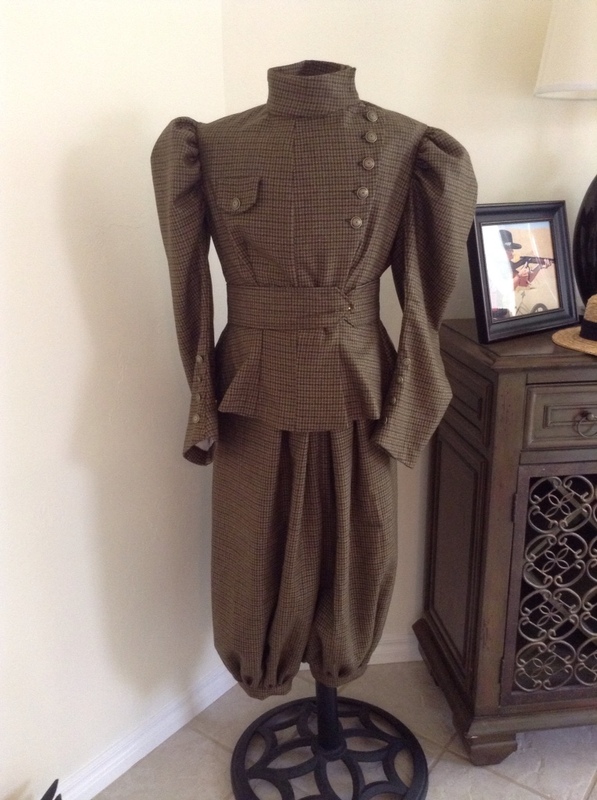 I’m sure in 1893 the suggested fabrics were blue flannel! A far cry from these whimsical patterns that Dirty Nerdy acquired. My favourite?! 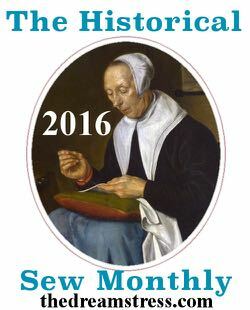 The pin up girls of course followed by the Liberty fabric. They were fun to do, probably make a couple changes next time I do this pattern but I love them. It's that time of year where cowboys and cowgirls come together for one of the biggest weeks of shooting. 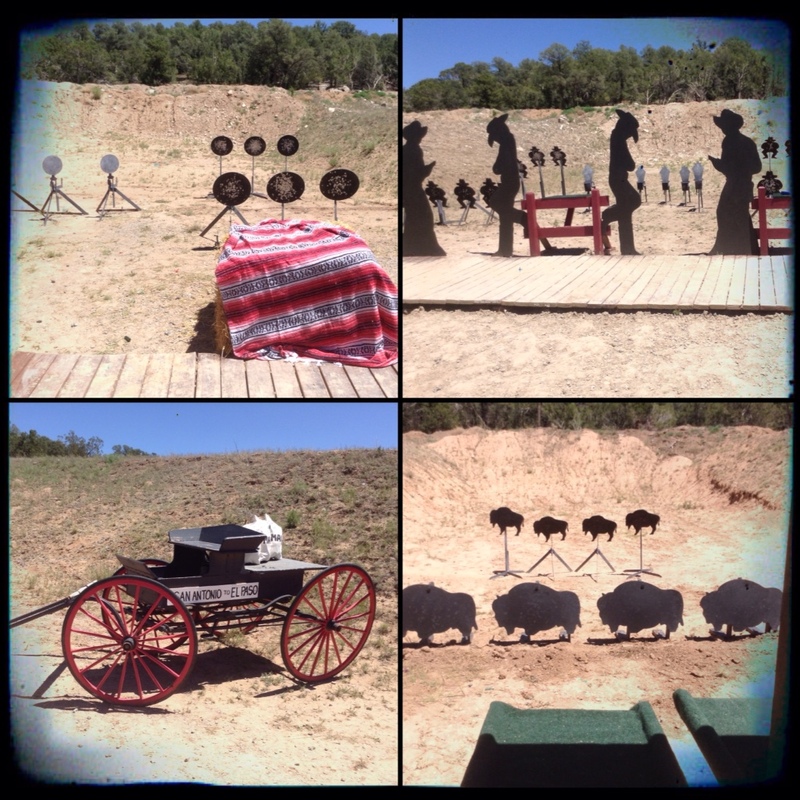 The World Championship of cowboy action shooting is the agenda at Founders Ranch, New Mexico. 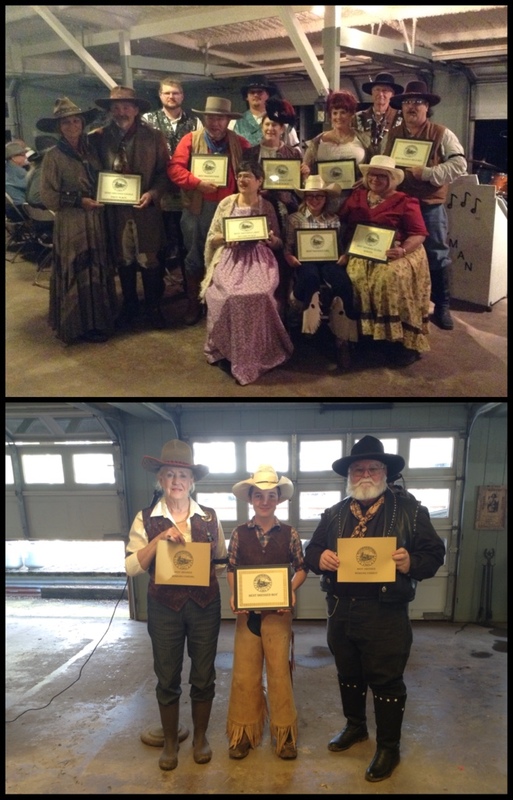 Five countries – Australia, Germany, Netherlands, New Zealand and United States of America competed for the top honor's in both Wild Bunch and Cowboy matches. This year, as previously reported, we decided to forego Wild Bunch and headed to Cortez prior to this week. Monday: picked up packs, caught up with friends and readied ourselves for the week ahead. A pleasant surprise was my picture on The Independent for Cowboy Days in Edgewood/Moriarty. 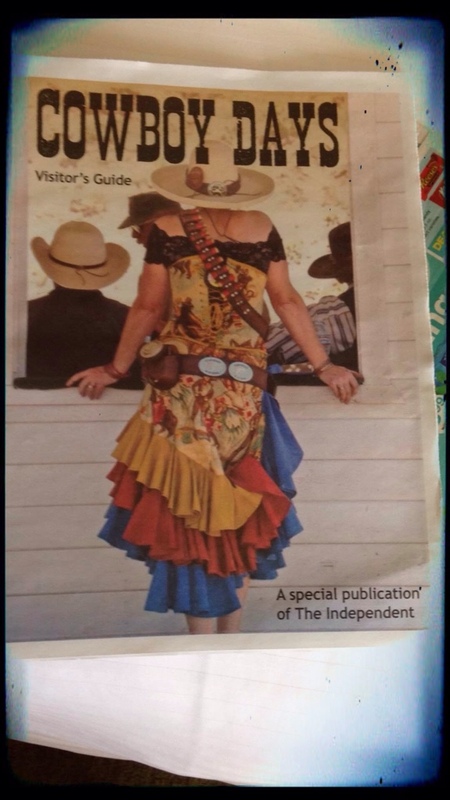 Thanks to Cat Ballou the photo BT Blade took of me during Wild Bunch last year was used for their front cover! Tuesday: we did 6 stages of warm up and attempted to get acclimatised to the altitude whilst running uphill or across some of the stages. 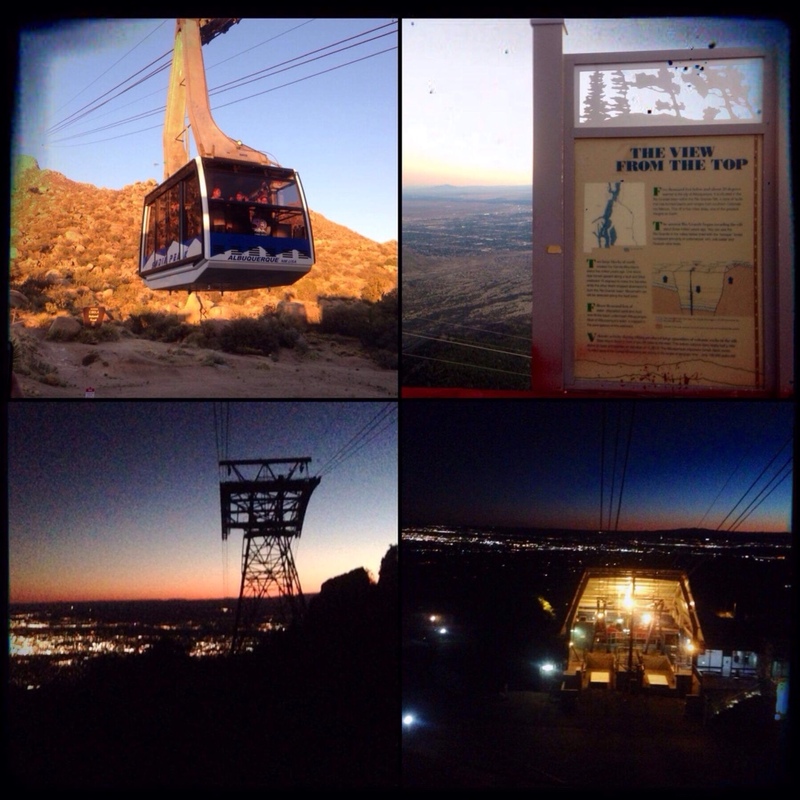 Tuesday evening we had a great trip up Sandia Tramway with dinner beforehand at Sandiago's grill with the Range Riders (from Australia) – Pearl Starr, Charlie Wagon, Judge Ruger, Tumbleweed Wagon, Sarah, Stan Wellback and Dallas Roarke. Wednesday: Doily Gang Clinic was on, instructing with Honey B Quick, Shamrock Sadie, Lefty Jo, Two Sons. We had 18 ladies attend the transitions clinic, some returning for the 2nd or 3rd time and others their very first. Plainsman, shotgun clinics and side matches were on. Cowboy swap meet, vendors are open and the crowds are starting to increase. 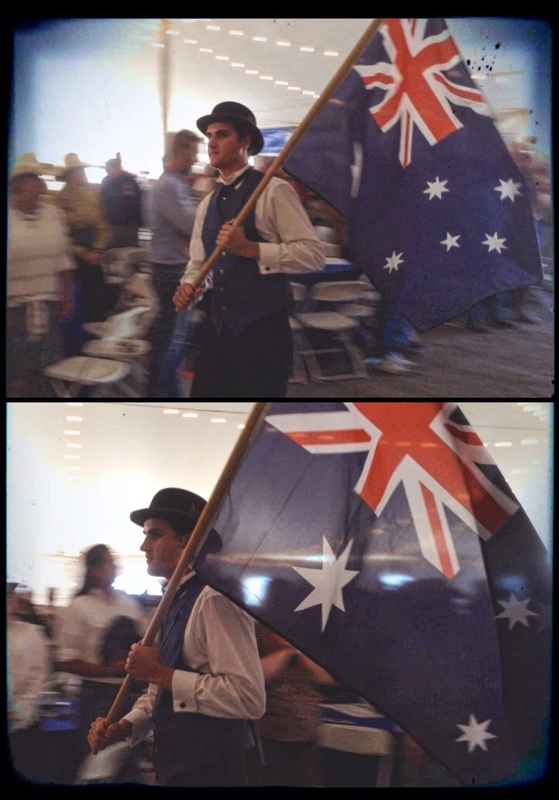 The evening kicked off with the opening ceremonies, Tumbleweed Wagon carried the flag for Australia. 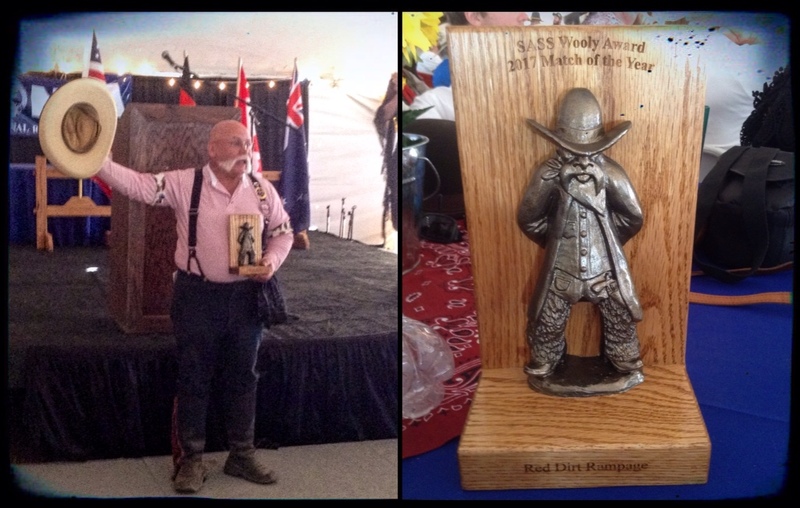 The Wooly Awards were announced with Texas Jack Daniels receiving one as 2017 Governor of the year and The Territorial Marshal's with match directors Missouri Mae and Flat Top Okie took 2017 Match of the Year for Red Dirt Rampage. The class of 2018 Regulators were announced! Congratulations to each and every one! Thursday: first day of main match and we had the late wave start. It's hot, dusty but ready for action! Stages 1-4. Friday: second day of main match, mid wave, stages 5-8, shopping with vendors and we're still having fun! Saturday: it's the final 4! With the cooler very early start we were soon done and all up to the total scores to see where we all finished. We had a great posse – Posse 25 with posse marshal Chickamauga Charlie, Polly Penny Bright, Coffee, Shotgun Boogie, Hell Hound, Rephil, TinTin, Slow Hand Don, Dutch Bear, Justice Ann, Coal Train, Buck Garrett, Chantilly Shooter, Hot Rock, Hud, Hawkeye Kid, Pearl Starr, Charlie Wagon, Jack and myself. With the posse shoot done, it was lunch, ice cream and head back to get ready for the banquet. 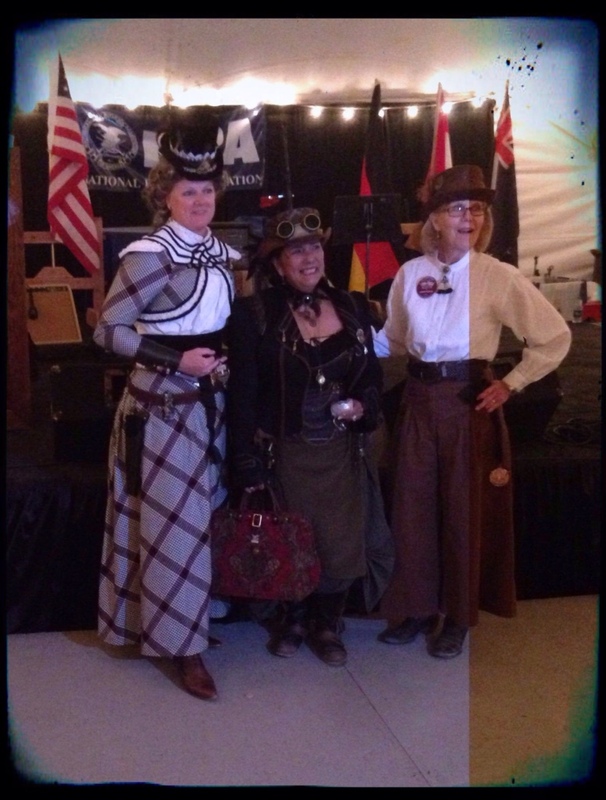 I attended the costume contest and was 2nd place in the new Steampunk category. Congratulations to EZGZ in 1st place. Congratulations to all other category winners and placings! There were some fabulous costumes! The beer flowed, the music played and some showed off their dance skills. 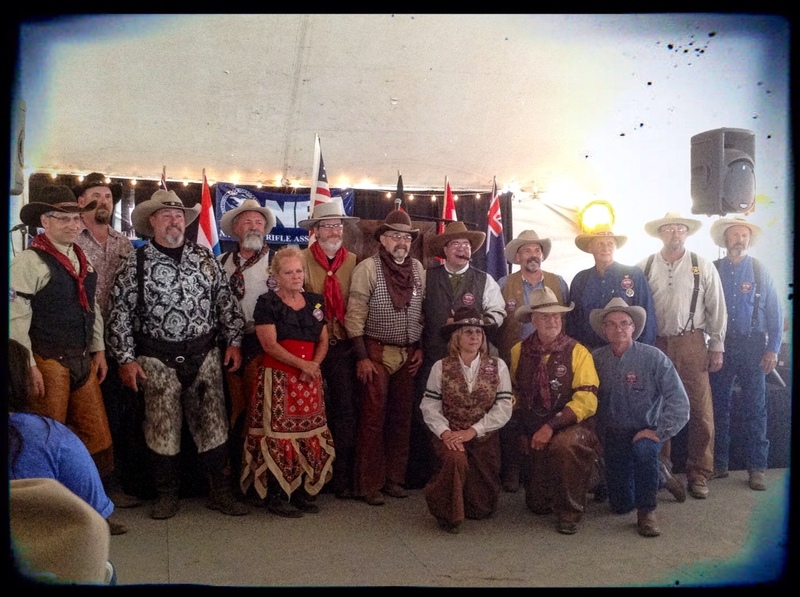 The top 8 Wild Bunch men's and ladies were announced, as was the top 16 cowboys and cowgirls. 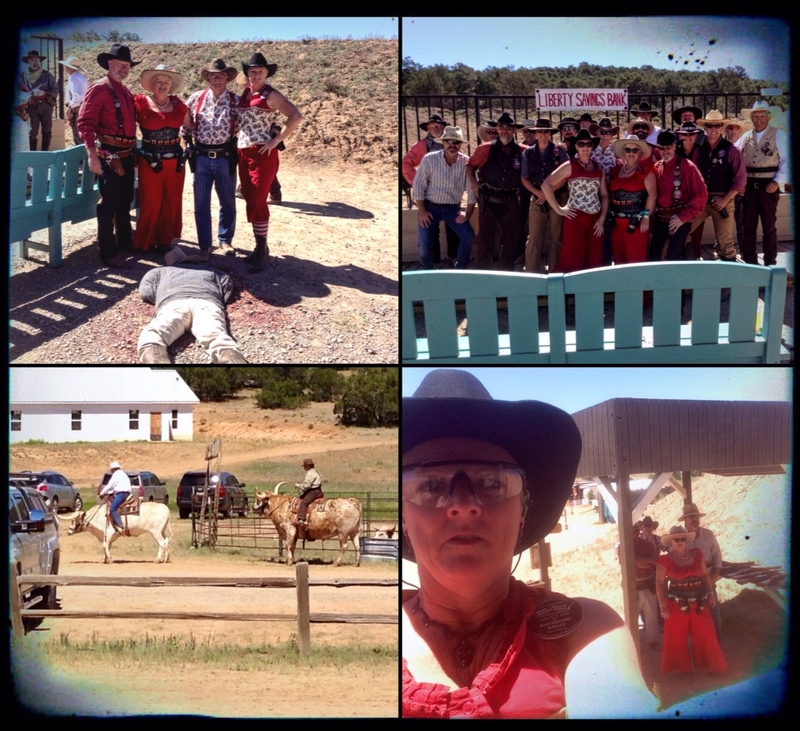 Clancy and I were the only two Australians to make the shootout this year for cowboy match and RC Shot for the Wild Bunch shootout as an alternate. Sunday: the shootout gets under way. Congratulations to Idaho Sixgun Sam and Last Chance Morales for winning not only the shootout but overall top lady and man for 2018 Wild Bunch. The cowboy shootout is run and final finish was Holy Terror for the ladies and C.S. Brady for the men. Jack finished 10th in his category with 1st place going to Long Swede, 2nd Hell's Comin, 3rd Silver City Rebel, 4th Angry Tom, 5th Lucky Thirteen, 6th Texas Mean Gene, 7th Fast Eddie, 8th Kansan and 9th El Lazo. Congratulations Silver Senior's on your placings! 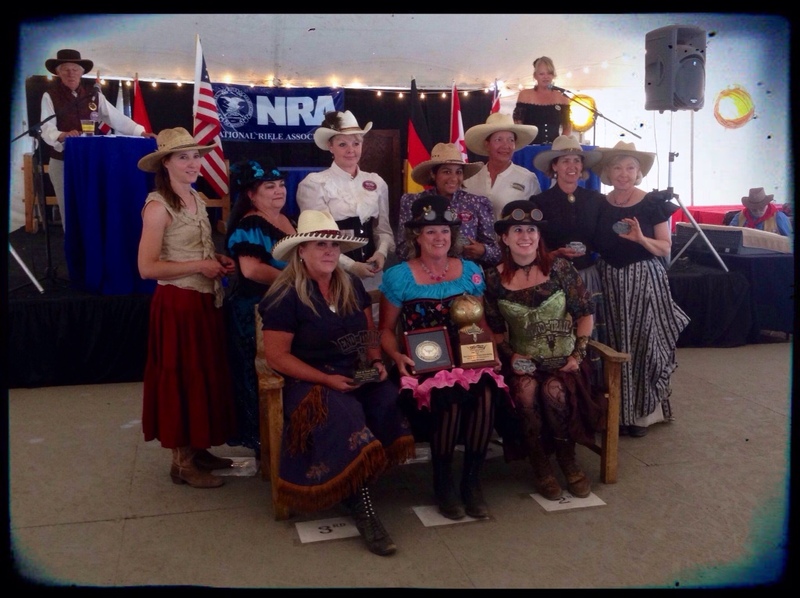 In Lady Wrangler category, 10th Wild Cattle Kate, 9th Ms. Laurie Darlin, 8th Ex Sighted, 7th Young Lady, 6th Ruby Jewel, 5th Idaho Sixgun Sam, 4th Legally Loaded, 3rd Clancy, 2nd Echo Meadows who cheekily offered to hold my World Championship trophy again. Lol! Congratulations ladies! Out of 22 Aussie's 14 placed, 2 received Spirit of the Game awards, 2 placed in costume and if I remember correctly, 6 or 7 got clean matches. 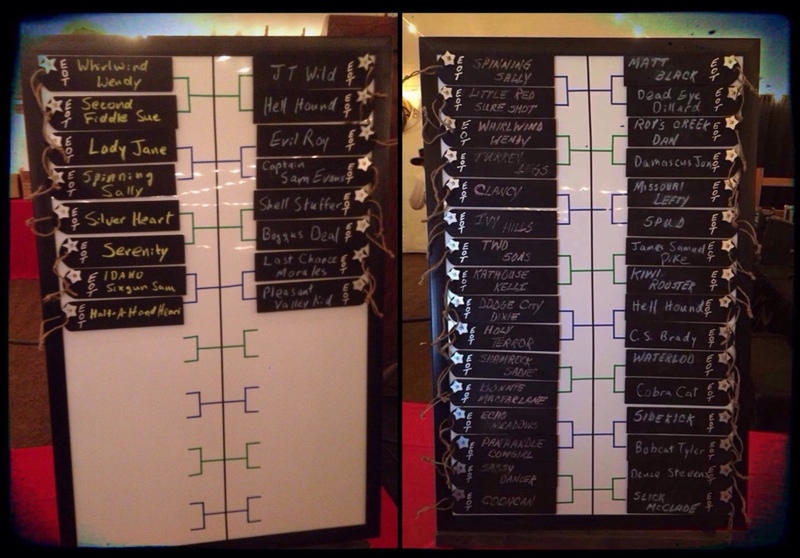 Overall winners this year were Matt Black and Holy Terror. 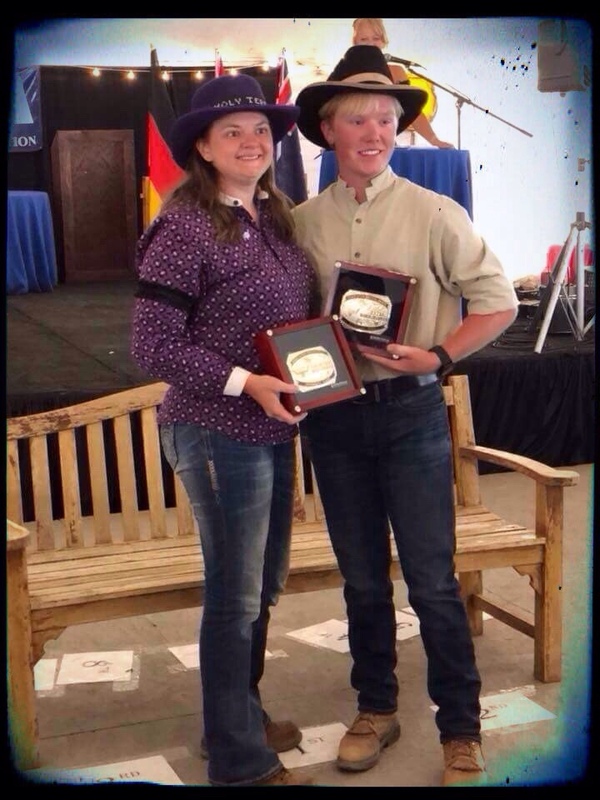 Congratulations to two fine young shooters! 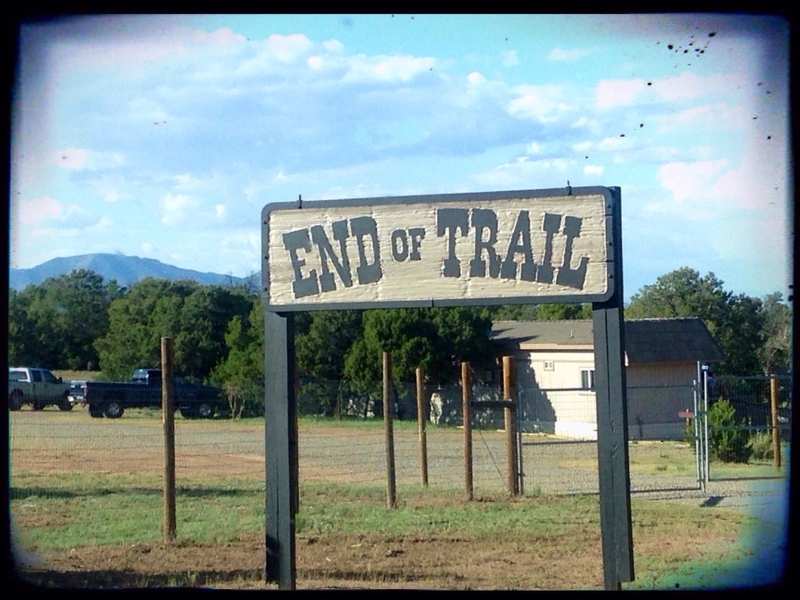 For everyone who attended End of Trail 2018, may it have been with goals achieved. Whether your first ever or multiple entry, I sincerely hope you enjoyed the experience. Travelling today listening to the usual eclectic mix of music of Elvis, Toby Keith, Darius Rucker; throw in some Australian Crawl, Lee Kernaghan, Dire Straits; sprinkled with a small dose of “not your grandmother's music” (or perhaps even your mother's!) Saddle Tramps and we were on our way to Kansas. 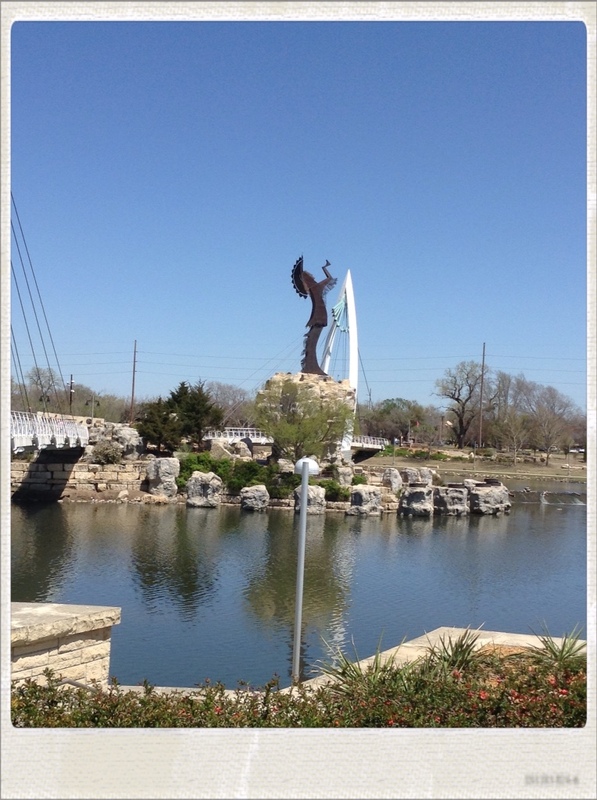 We took a slight detour into the older part of Wichita and headed for the river. 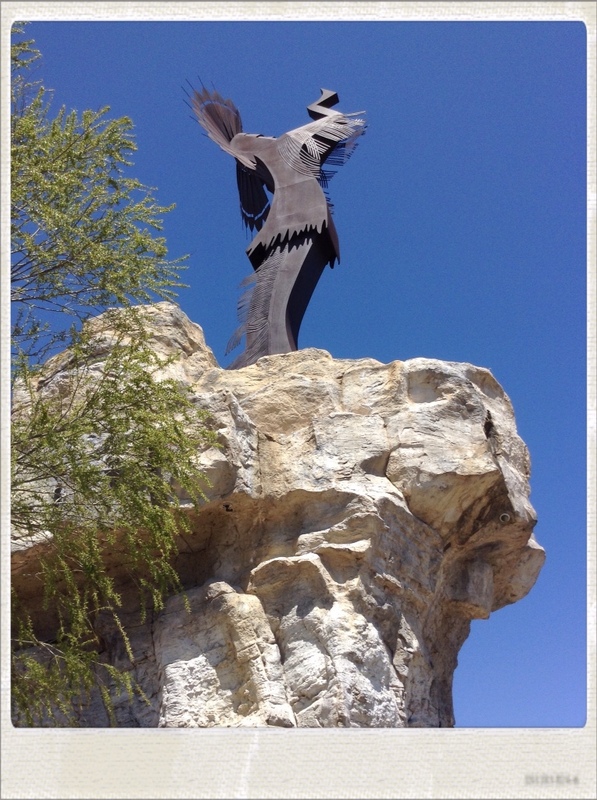 We found 'The Keeper Of The Plains' a 44 foot tall cor-ten steel sculpture that stands at the concourse of the Arkansas and Little Arkansas rivers. Before we headed to see that, we found ourselves inside Exploration Place. The equivalent to Questacon, in Canberra back in Australia. I had asked at the counter about restrooms and the girl at the counter pointed me to the right direction and for how to get to the bridge to the statue. It's no wonder the lady at the entrance, waiting on school kids, was having trouble to round them up as they were probably reading all the doors too. Anyway, Jack and I decided that it would probably be a good place to visit but the bright spark reckoned it would be quieter on a weekend??!!?? I don't know about that. Off we headed to the bridge that would take us across the river to a small exhibit and the spectacular statue before us. 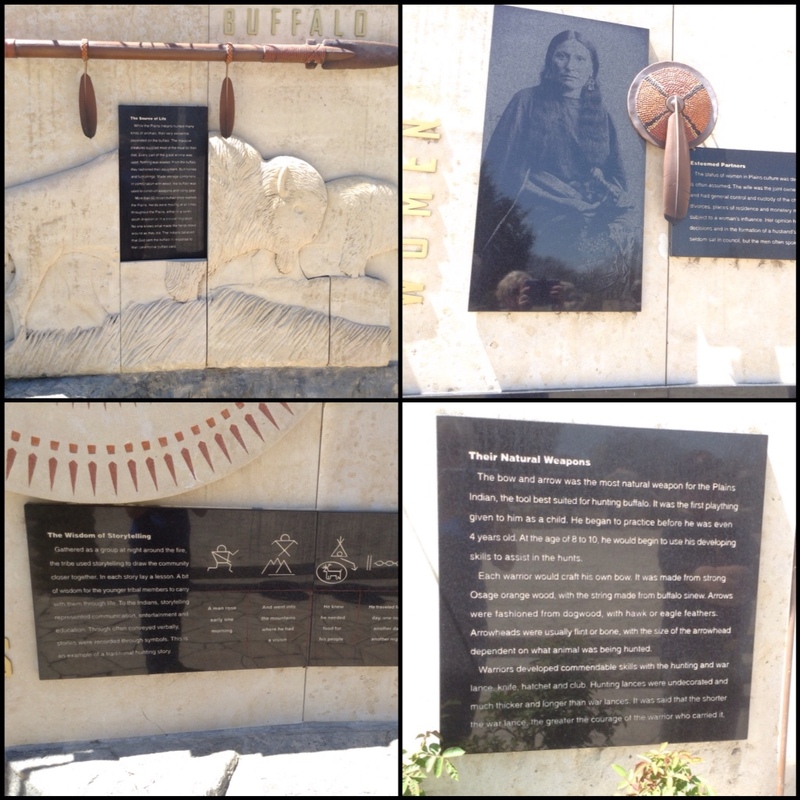 Around the base of the statue are two walls of an outdoor exhibit made from granite and other media portraying the American Indian life, culture and language. 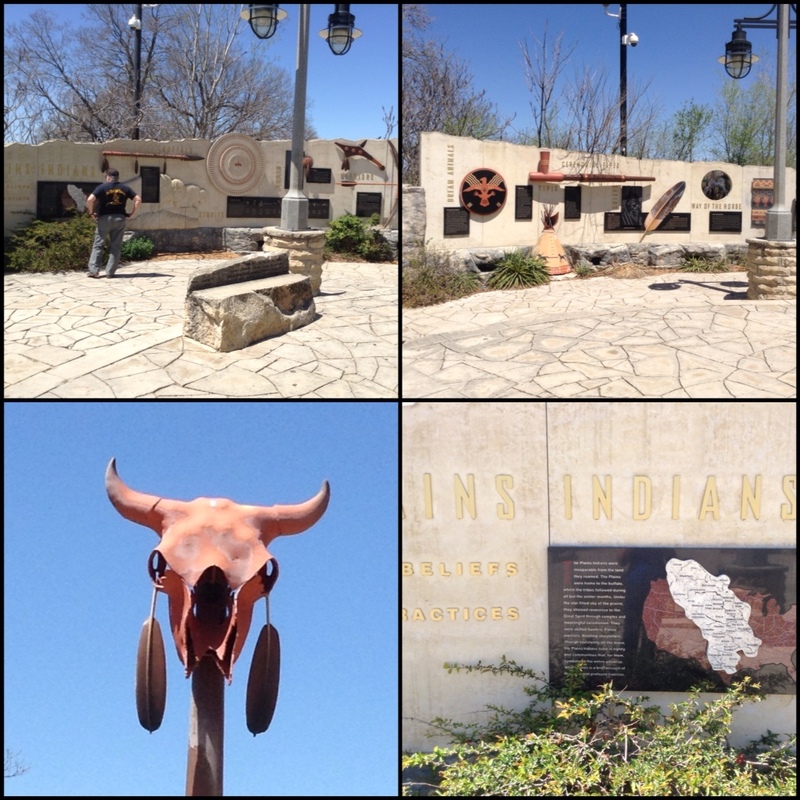 The sculpture by Kiowa-Comanche artist, Blackbear Bosin features music in the background and small water mist jets as you meander around the base of the rock it is perched upon. 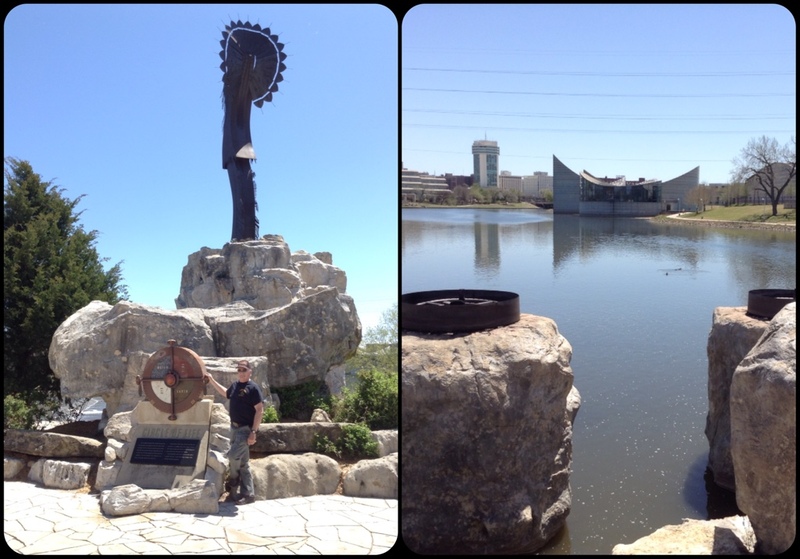 Out the front of the statue on the river are fire pits known as 'the rings of fire' that are lit at dusk which would be a sight to see! This was one of those places that gave an ambient and serene backdrop to a bustling city beyond the rivers edge. 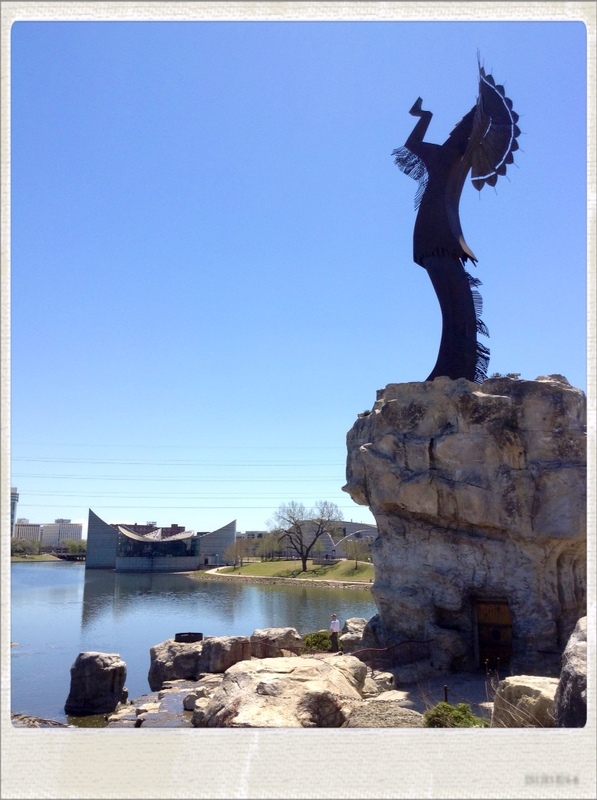 A must see if you ever get up through Wichita, KS. After Land Run (not included in the previous blog) I set to getting a surprise job done for Annie D Vine. 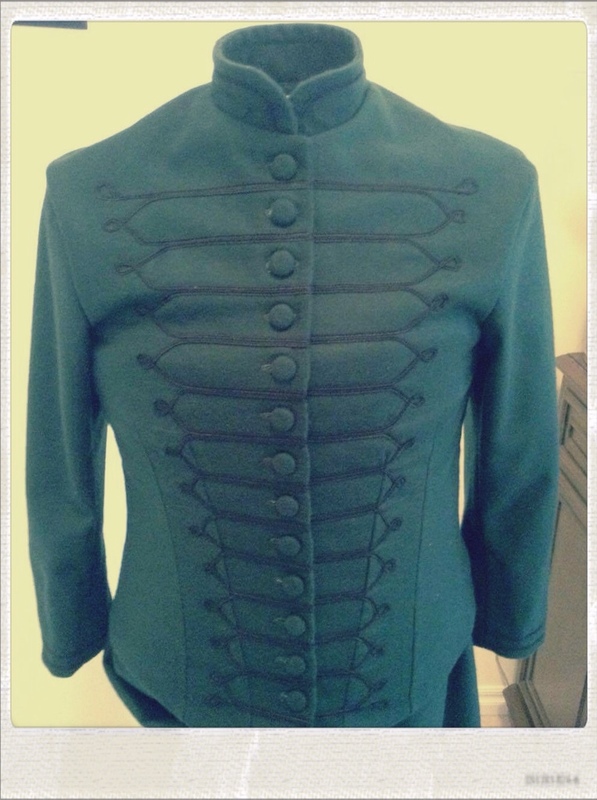 Her 1880-1890's riding habit in a Kelly green Melton Wool. Hawkshaw Fred and I had discussed the making of this for Annie's birthday without her knowledge which made me slightly nervous as we had only briefly discussed colour and thrown a couple of pictures her way. Got the job done though, a full on week, trim hadn't arrived from Ireland and had to order more soutache which really put the pressure on. Not one to back down from a challenge though, it was game on! 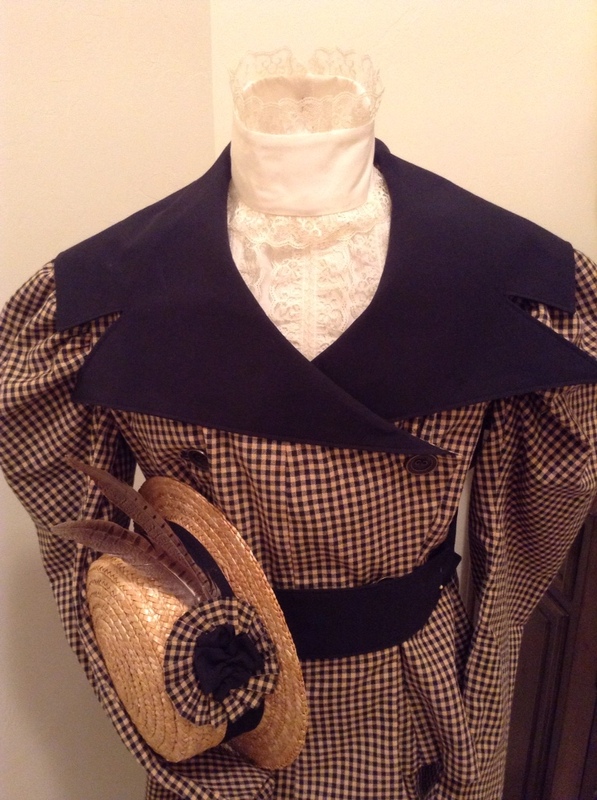 The Victorian riding habit is an interesting skirt suited for ladies to ride side saddle and still be involved in the pleasures of equine sports. A wider right hand side allows the wearer to sit upon their trusty steed and the skirt would drape nicely over their right knee and the saddle horn without revealing any knees or ankles. Keeping decorum to the max! Once riding exploits have been had, the lady after alighting from her horse, can hitch up the skirt and fasten it in back on a button. 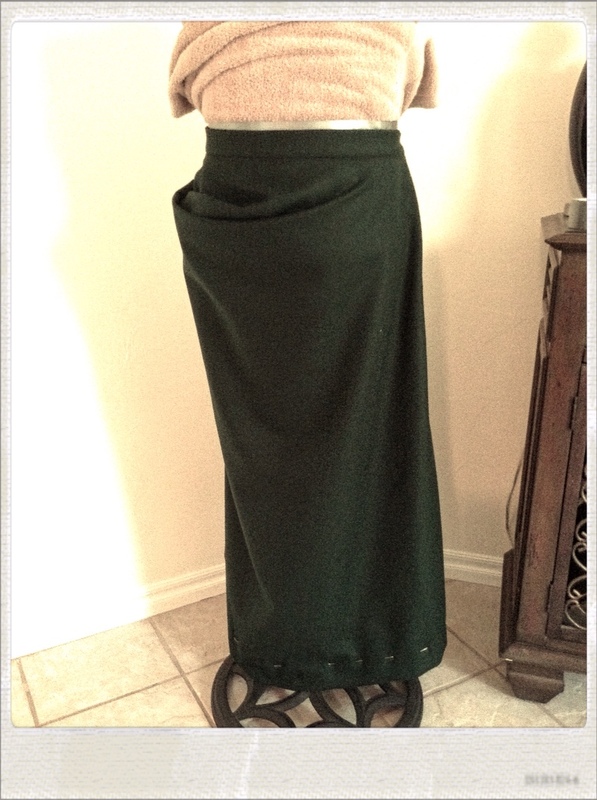 This allows her to walk freely without tripping over the excess skirt. 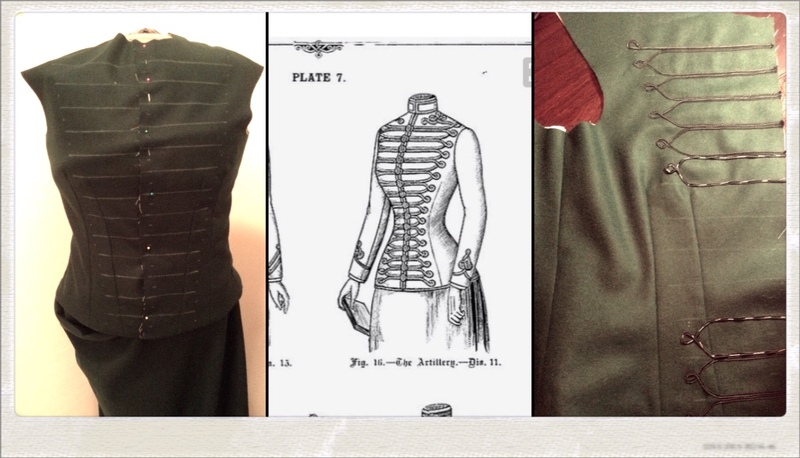 Riding habits (as mentioned in the Truly Victorian pattern) were 'severe' in look and usually had no trim. I did however, find some old photographs of some with the military style braid work, so this is what we went for to add a little character at least. The surprise worked! It fitted perfectly! Can't wait to see Miss Annie in her riding habit with all the accoutrements. Maybe I'll see her doing some riding like this? Or not! From what I've briefly read, it took 2 men to get a lady up on her side saddle and there were many injuries and issues with restraining your horse BUT these are true pictures of women jumping their horses side saddle! Incredible. Now I say that very casually, as it was still late 1890's when 'Sporting Costumes' went through a change for women. 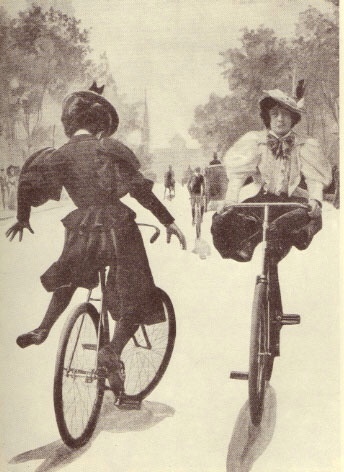 With women now being able to be 'wheel women' amongst other sports, came an introduction to ditching the petticoats and skirts. This arose out of a 'safety' factor so you didn't end up A over T and being very unladylike during an untimely dismount from your bicycle. I had looked at the cycling costume before but it wasn't until 'Tacky Jackie' asked if I would make her one that I got more interested in it again. I quickly bought the pattern and got fabrics and away we went. 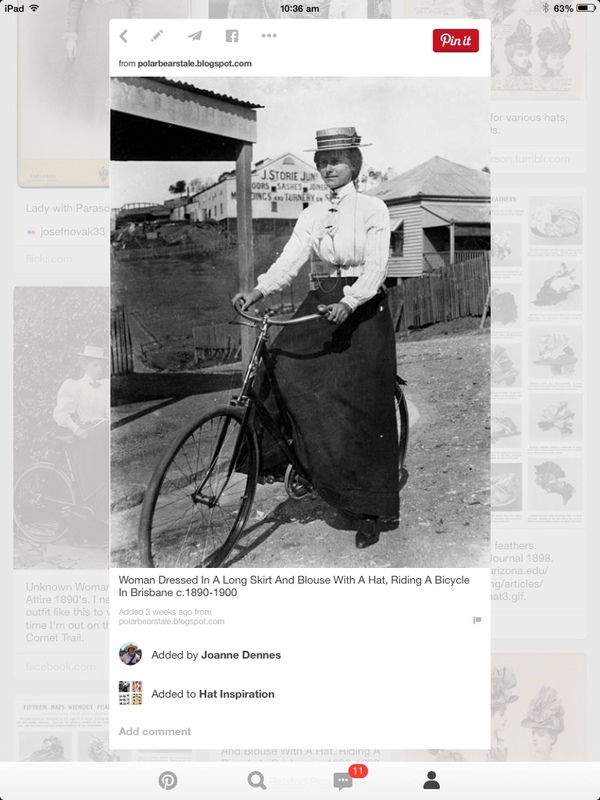 In my research I had found pictures of ladies in skirts on their bicycles with large hats or boater style hats. Still looked a little impractical but I have seen a friend riding her original antique cycle in complete skirt ensemble! So it is possible. Wasn't what we were looking for though. 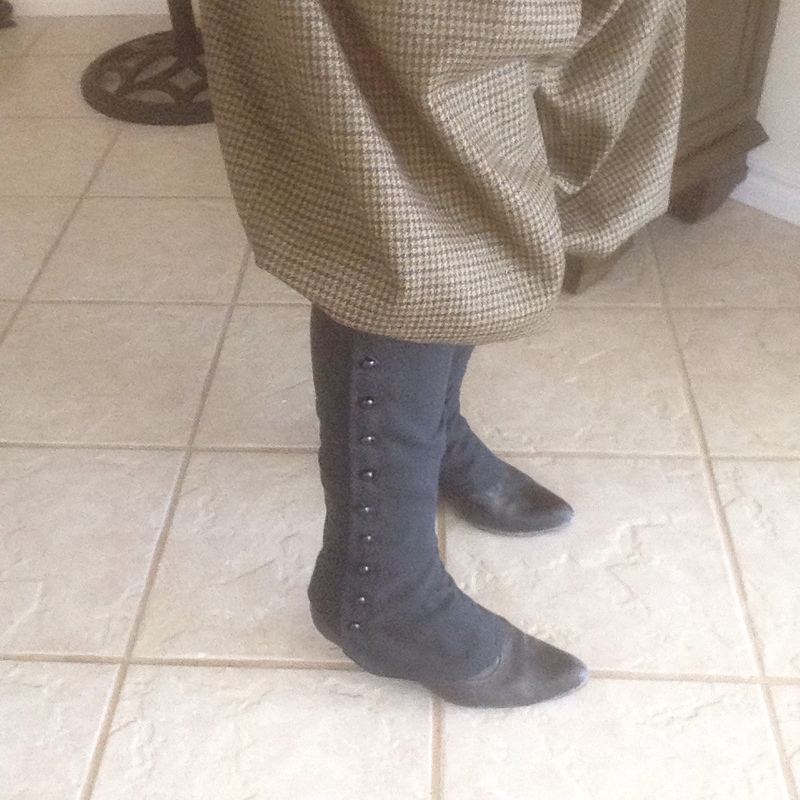 Wanting the more practical version of Turkish bloomers and basque, this would bring 'Tacky Jackie' and 'Kathouse Kelli' into practicality fashion of the late 1890's. 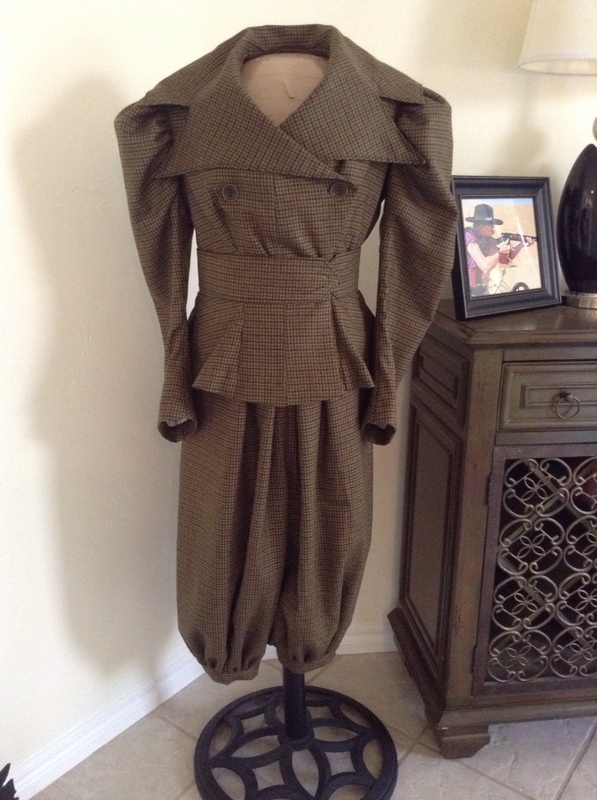 This picture found at the below link from the Metropolitan Museum, you will find a few other pic's at that site of this particular suit. It is original and I do love the detailing on it. However, I feel this picture probably says it all! Probably more what I perhaps would have been like, had I been allowed out of skirts back then! Lol! 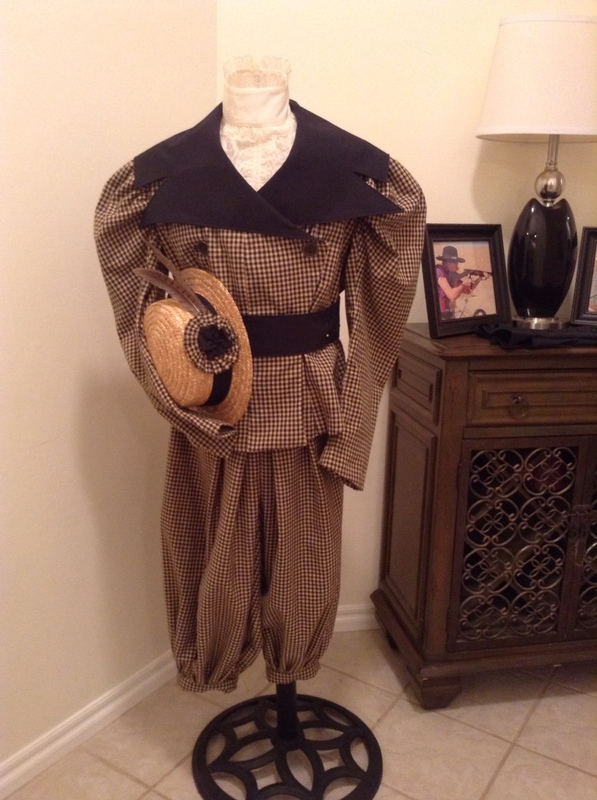 The pattern used for these is Laughing Moon Mercantile #110 Ladies 1890's Sporting Costumes – with Leggings. 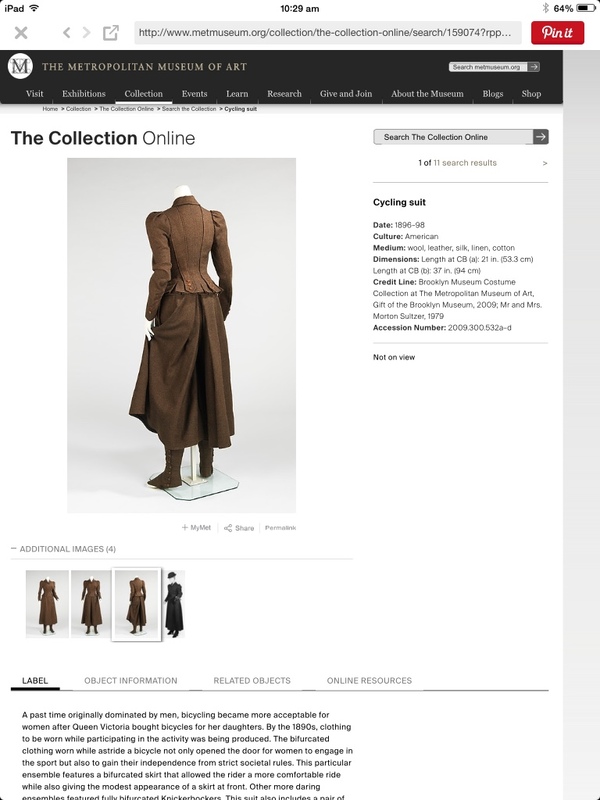 It has a great bibliography, descriptions and excerpts from fashion books from the era. Too much for here today. So, Jackies choice was a small check print cotton. 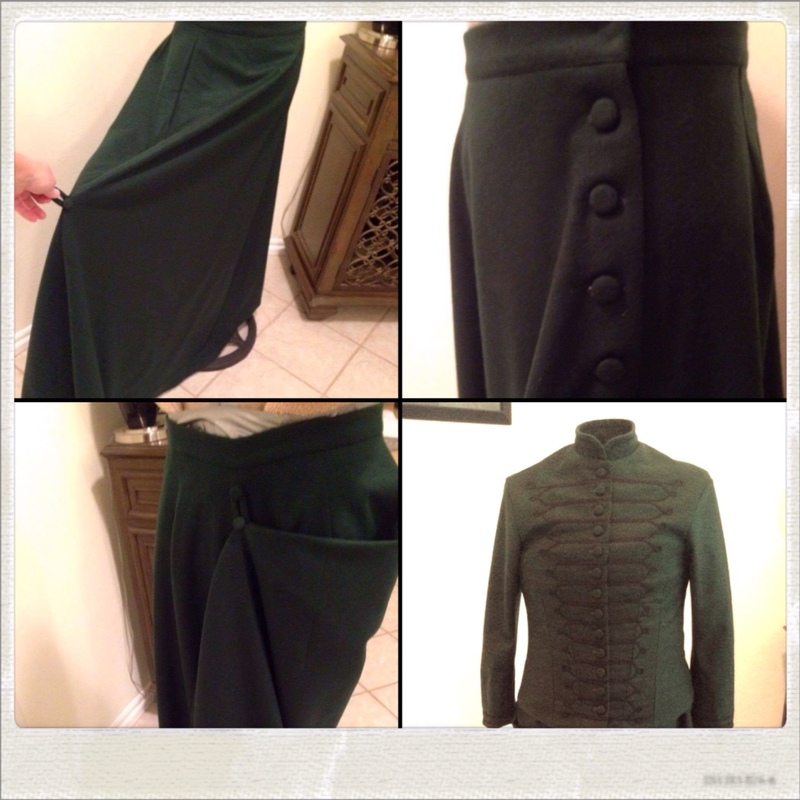 She didn't want a wool fabric so this is what we created,with a contrast belt and collar in black. 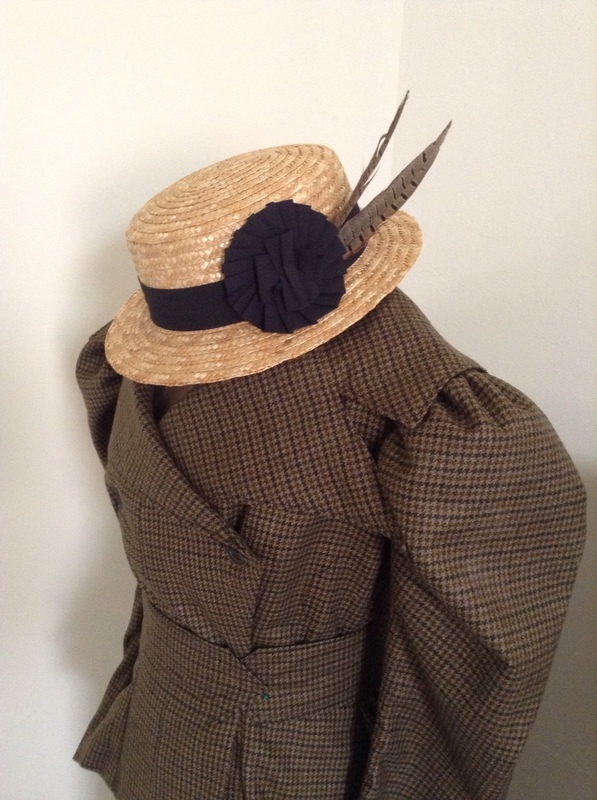 She has cream lace dickie, black buttoned leggings and of course the ensemble wouldn't be complete without her new boater hat. I had fabric that I had bought from the lovely 'Aspen Filly'. A small houndstooth wool, the perfect colour for keeping dust unnoticeable whilst out riding. I'm waiting on a neat buckle to go on this one. Haa! Bloomers on with leggings! I'm now waiting on a button hook to come as this was a chore doing it without one! I also had enough fabric for a Hunting Basque (included in the same pattern) so now I can interchange the two of them. Waiting on an antique hunting buckle for this one and have yet to make an appropriate hat. I want to put a dead bird on it but can't seem to find them yet. Will keep looking. So there you go! Something different and unusual compared to my other gowns but now it's back to corsets and shooting outfits for now. Will get photos of us wearing them later!